The further along kids get in their science education, the more questions arise about how and why things happen. These year six science worksheets are the perfect way to supplement lessons and get kids engaged in asking questions and making discoveries. There’s a fascinating worksheet to entice any young scientist, ranging from topics of human anatomy and chemistry to plate tectonics and ocean science. 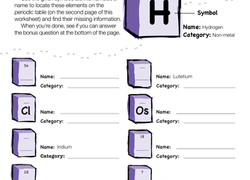 Little chemists can learn more about the elements in the periodic table with this helpful worksheet about molecules and compounds. Where is the liver located? Using the diagram as a reference, kids cut out the different parts of the liver from this worksheet and piece them together. Learn about a famous woman of science, Rosalind Franklin, and how she contributed to the discovery of DNA's double-helix structure. Colour in this diagram to see how a tree works and to better understand how many plants transport their "food". Need to know all about the lungs? Study up with this comprehensive lung anatomy worksheet. Get a brief history of the atom with this introductory page for young physicists! 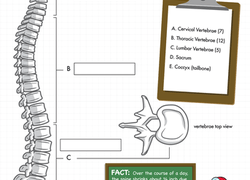 Quiz your kid on the names of bones in his spine with this colorful worksheet. With this enlightening worksheet, kids will get a glimpse into how our brains' different parts function in surprising ways. Bake a cake with your child and discuss the chemical reactions that take place between the various ingredients. Feel free to experiment with variations in the batter. For example, if you add an extra egg or a double dose of baking soda, what do you think will happen? Make a life-sized map of the human body on a long strip of parcel paper. Help your child draw and label all the different organs, bones and muscle groups. Make a paper airplane and discuss the physics of aerodynamics. Experiment with different airplane shapes and see which ones go the farthest and the fastest.